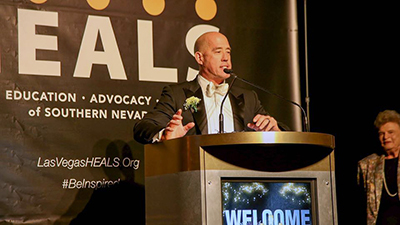 On October 27, 2016, Dr. Michael Crovetti was honored to be recognized by Las Vegas HEALS, becoming one of this year’s six recipients of the “Inspired Excellence in Healthcare Awards.” The event was held at the Four Seasons Hotel in Las Vegas, and was a memorable evening for those attending. Public acknowledgement is a funny thing, and publicly receiving an award is one of those things people tend to form opinions about that can be bad or good. It’s easy to understand how that happens, really. Our society focuses a lot on competition and the desire for recognition – and sometimes, those rewards seem to be a bit out of proportion to the accomplishments that were made. At other times, though, that recognition is very well deserved – more often for those that are based on a collective body of work, rather than a single achievement. Yet even so, there are those in the latter category upon whom the bestowing of that recognition is an unexpected, flattering, and very humbling surprise. Such was the case for Dr. Michael Crovetti earlier this year when told he was unanimously chosen by the Board of Las Vegas HEALS to be one of its 2016 recipients. His reaction to the news brought up a relatively uncommon response, as he explains. “I was lucky to find my passion early in my career,” reveals Mike Crovetti. “And since then, I’ve been focused on my work, continuing to learn, teach others, and do all I could to help find solutions for my patients. It’s something that just sort of happens – day after day, week after week. You don’t think about it in the larger sense, really. You just get up and do your thing, put your pants on one leg at a time like everyone else, and head out the door. You see that? No expectations. No attitude that such accolades are deserved. It was a “Wow, really?” moment in the life of a man who never saw it coming. What, you might ask, are some of those accomplishments? Perhaps the most obvious is Crovetti’s pioneering advancement in introducing an innovative surgery option to the Las Vegas valley. Coronado Surgery Center and Surgical Recovery Suites brought the needs of his orthopaedic specialty out of the hospital and provided a state-of-the-art, quiet, comfortable, and healing option to his patients (which was no small bureaucratic-pile-of-red-tape to manage). He has been a driving force in the practice of orthopaedics and sports medicine, always innovating, challenging the status quo, and finding ways to improve techniques, healing, and recovery times. They say “Nice guys finish last.” But that’s not a belief we subscribe to – at least in the way most people do. On one hand, maybe people say they finish last because they never stop being “nice guys”- they’re just that way to the very end. On the other hand, maybe the saying itself is a lot of bunk. Because those who put one foot in front of the other, day after day towards a larger purpose don’t see it as a race. For them, it’s a way of life, just how they choose to make the world a better place. We think Dr. Michael Crovetti is a great representation of both sides of that coin.